It’s not just about producing something; it’s about the ability to efficiently market and profit from it. Seasonality is defined as a price pattern in history that has repeated year after year. While this does not guarantee the same result will happen in the current year, but can provide better insight into what has occurred in the past and helps to identifies opportune times to hold or sell some of the physical commodities you as a producer have throughout the year. 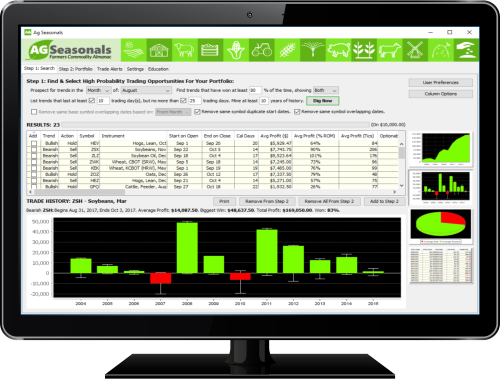 Whether you are trying to lock in a price, hedging your physical positions, or trying to identify periods in history where prices are seasonally higher/lower, then Ag Seasonals Software can help you. Software Satisfaction Guaranteed - We're confident Ag Seasonals can assist you with your Marketing. If you're not happy we're not happy, simply contact us within 30-day of your purchase and you'll receive your money back, no questions asked. Ag Seasonals Farmers Commodity Almanac Helps You To Make More Informed Marketing Decisions To Improve Your Farm Economy.